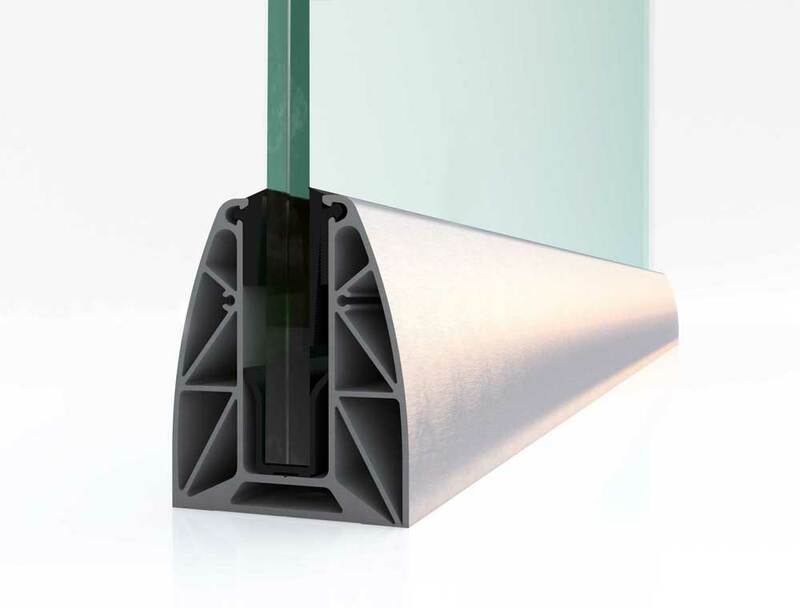 Glass mounting system without any vertical support columns made of uniform aluminum profile 80x100mm in size. The greatest advantage of the SB 8010 is its quick installation, as it does not require alignment or ornamental base caps for its finishing. It is directly installed on the flooring in one piece, and can support glass-boards of up to 100cm in height kai 16mm in thickness, laminated or laminated tempered. Replacing the glazing is easy, and does not cause any damage on the flooring or on the system itself. Its U shape holds and ties up the glass-boards along the whole length of the mounting base, by employing a specially designed, hard elastic gasket, which nevertheless allows the adjustment of the glazing’s verticality. The profile can be anodized (natural anodization or stainless-steel imitation), as well as electrostatically coated in any RAL color. The mounting base is fixed onto the flooring with special M8 (index) plugs in the chamber. In this way the system is installed without technical difficulties. The system’s mounting base is wrapped in a film, to prevent scratches during modification and installation. The product is available in 5m and 6m rods. The elastic gaskets seal the system’s chamber from any water inflow. Suitable for the formation of glass railings on balconies or wherever else a glass parapet may be needed. Easy to install: The base is installed in one piece onto the flooring and the glazing is easily mounted on it.